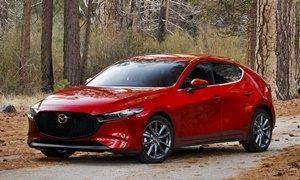 I have a 2014 Mazda 3 sedan with 34,000 miles and I like it a lot except for the noise inside. The tires are stock with normal wear. The new noise is coming from back right side only when driving. Almost sounds like low frequency wind noise while driving with the windows down, I wonder if it's coming from the back window? Does noise change with opening the window on that side? Can someone sit in the back seat and pull the door even tighter to see if noise changes suggesting seal leak? This could be a bad wheel bearing. My first thought was a bad wheel bearing but with only 34K probably not unless it's a known early failure issue. Jack up the rear end and with your hands on the wheel at 3 and 9 then 6 and 12, see the there is any play in the wheel. Also check your lug nuts to make sure they're tight. My second thought is chopped tires. That can give you the same type of noise and can be hard to diagnose just by looking at them even if they look like they're wearing normally. Have them checked by a tire professional. My last thought is a bent rim. Especially if you have low profile tires like 50 series. Again, that can be checked at a tire shop etc. Good luck and let us know what you find out.